So, you want a blender, but can't decide between which one to get? This Vitamix vs Nutribullet Rx vs Pro 900 guide can help! I've been using both brands for years and I'm confident that I can guide you towards the right decision. The pros and cons of each brand. How the most popular Vitamix and Nutribullet models compare side by side. My recommendation on how to make your final decision. The Nutribullet Pro 900 is the perfect balance of affordability, power and function. If you're looking for a really solid personal blender and have a smaller budget - that's what I'd go for. It's powerful, easy to use, and is great for basic blends like smoothies, salad dressings and even dry grinding. The warranty is only one year, but I think it's a fair compromise given everything it comes with and the price point. If you're looking for a comparable Vitamix - I highly recommend the Explorian E310. Because of it's smaller size and no-frills design, the Vitamix Explorian E310 is my favorite pick out of every Nutribullet and Vitamix model. It's not as convenient in terms of to-go cups as the Nutribullets are, but it's powerful and affordable. The E310 is slighty smaller (48 oz jar) than most other Vitamix blenders, making it as ideal for a single person as a Nutribullet would be. With a 5-year warranty, you know it's going to last you a long time. What About the Nutribullet Rx? I think the Rx is great blender in itself -- its got a lot of power and really awesome accessories. It's also the only Nutribullet I know of that has hot soup capabilities. The warranty is just way too short for the price range. If I'm going to be paying a lot of money for a blender, I like knowing that I'm going to be using it for a while. Unless you can score a really good deal -- I'd rather get a Vitamix or Pro 900. What Are the Main Differences Between a Nutribullet and a Vitamix? The three main differences between the Vitamix and Nutribullet blenders comes down to price, warranty and design. Vitamix blenders have much longer warranty than Nutribullets. Variable speed control: All Vitamix blenders have the ability to crank the speed from low to high. This allows the user to more easily get a vortex going and control the fineness of ingredient chopping. The Nutribullets only have one speed. Tamper: The tamper (or plunger) that the Vitamix allows the user to push ingredients towards the blades during the blending cycle. This prevents the need to stop the blender and readjust ingredients. If ingredients get stuck on a Nutribullet, the user has to stop, readjust, and blend again. Venting Lids: The only Nutribullet that comes with venting lid option is the Nutribullet Rx. Other Nutribullets aren't designed for hot liquids. They can explode. But be SURE to fully read the Rx's manual before blending so that you know the specific temperature guidelines. They actually recommend starting all soup contents at room temperature before blending. Vitamix blenders on the other hand are all designed for hot soup. Even the S-Series personal blenders comes with an option for a cup with a venting lid. Jar Size: Nutribullets are more ideal for singles or small apartments because of their small footprint. They also have blending jars that are geared towards single servings rather than huge batches. Vitamix has different blending jars as well, but most of the time they are sold separately. Convenience: Nutribullets come with packages that allow the user to drink right out of the blending cups. Aside from their S-Series blenders and newer Ascent models, Vitamix doesn't offer cups like this. Plus, they're usually sold separately unless you can find a specific package. Vitamix blenders usually have a much higher price range than Nutribullets do. Prices are always changing at the retailer level, but you can expect to pay at least 3 times the price for any of the Vitamix blenders. 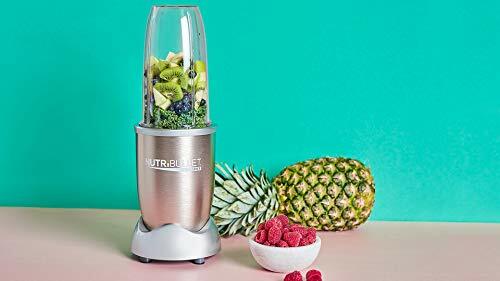 On the surface, it looks like you're getting much more value with the Nutribullet Rx compared to the Vitamix 5200. In some ways, the Nutribullet Rx looks pretty good - a more powerful motor, convenient cups and the ability to make soup. The Nutribullet Rx also has a bigger convenience factor because of it's smaller footprint and the ability to easily drink out of the blending cups. But the Nutribullet Rx falls short in two main areas: Lack of a Tamper and Warranty. Blenders with tampers are great because it ensures that no air pockets form and that no ingredients get caught on the sides. Not that important if you're doing smoothies and soups, but can make a huge difference for hard and solid jobs like blending nut butters. What's really important is the warranty. If you're going to be investing in a blender, it's a huge difference knowing that it's going to work for a long time. While the Vitamix 5200 is usually found at a higher price point - the Nutribullet Rx isn't cheap either. Consider that it's guaranteed to last 7 years compared to 1 year - it's worth going for the Vitamix here. Finally, even though the motor is slightly weaker - this doesn't matter in terms of function. A Vitamix with it's tamper can blend through just about anything with ease. The Vitamix 5300 blows the Nutribullet Rx away in terms of warranty (7 years compared to 1 year). But the Nutribullet Rx beats it on convenience. As mentioned in the section above, the Nutribullet Rx has a ton more convenient features than the Vitamix 5300 has. These features come in the form of multiple cup sizes and the ability to consume the blend right out of the jar or store it for later. This is especially true if you're doing smaller batches. The Vitamix 5300 with it's wide and low container requires a larger amount of ingredients to be efficient than the 5200. As a single person, it would be easier on most occasions to use the Rx. But again - the difference in the warranty is just too great for me to recommend the Rx over the 5300. Also, you can get different sized jars for the Vitamix if needed (although they are sold separately). The Vitamix S30/S50/S55 are personal blenders from Vitamix which has a closer design to the Nutribullet Rx than the others. They are not nearly as powerful as the other Vitamix blenders, though. When looking at user reports on the Vitamix S30, it's apparent that it's not universally loved like all the other Vitamix models. Problems reported with the S30 include overheating, motor not performing like it should, and leaking seals. The S50 and S55 both have similar complaints from several user reviews I've looked at. Many people agree that the personal blenders for Vitamix aren't worth the price. Even though it comes with a 5-year warranty, I can't recommend the Vitamix S30, S50 or S55 over the Nutribullet Rx -- even as a Vitamix enthusiast! There isn't much difference the S-Series models aside from the extra pre-programmed settings and color selection. The typical price-point on the S-Series models are also extremely high for a personal blender. 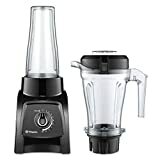 If I had to get one of these blenders - I'd go for the Rx, but I'd rather get something from the Vitamix Explorian E310 for maximum power and function or a plain old Nutribullet Pro 900 because of it's affordability. The Vitamix E310 is the number one model I would recommend over the Nutribullet Rx. It's smaller than your typical Vitamix, but much more powerful than the S-Series Personal blenders. 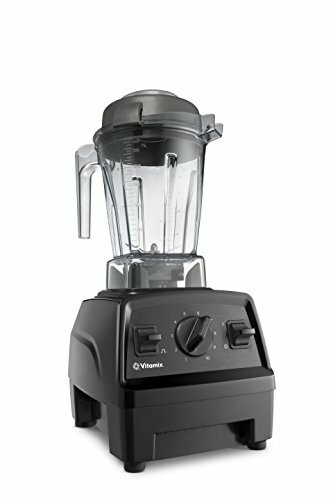 You can find the E310 at a fair price point and it comes with Vitamix's reliable 5-year warranty. 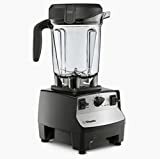 It's 48-ounce container is smaller than the typical Vitamix which makes it the perfect hybrid of a personal blender and large counter-top unit. And even though the motor is slightly weaker - the design quality on the E310 makes up for it. With the use the variable speed function and the tamper, you're not going to experience many issues of ingredients getting stuck. The E320 is also good, but since it's slightly bigger, I think the E310 is more comparable to the Nutribullet Rx. The Nutribullet Rx still wins in terms of convenience. I love the fact that you can drink out of the blending cups and I do it all the time on my Nutribullet 900. But at the end of the day, if I had to pick one blender I wouldn't trade my Nutribullet for my Vitamix. The E310 is the perfect balance of power, function, price and reliability which makes it a great candidate for someone looking for a smaller personal-style blender. Compared to the Vitamix 5300, the Nutribullet Pro 9000 is a lot more limited in what it can do. It can't use hot liquids, it doesn't have a tamper and it's warranty as a lot shorter. However, the Pro 900 has two things going for it: price-point and convenience. 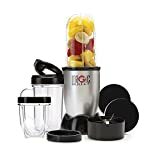 With all the cups and accessories - it's the perfect personal blender for someone that wants to make simple smoothies on the go. It's even good a good blender for frozen fruit - I use it myself! If I could have one blender and price wasn't a factor -- I'd much rather have the Vitamix 5300. However, I'm convinced that the Nutribullet Pro 900 will be more than enough for the average person. You'll be able to make smoothies, sauces and much more. I even use my Nutribullet to make banana ice cream. Generally speaking, the Vitamix 5200 is a much better blender than the Nutribullet 900. It can blend more things - including hot liquids which should not be done in the Nutribullet 900. It also has a longer warranty by 6 years! But again - you don't necessarily need a Vitamix 5200. If you're short on vertical space (low cabinets), you might struggle to find room on the classic tall Vitamix jar. If you're on a budget and just want a convenient blender, the Pro 900 is really good. My opinion on the Vitamix 5200 in relation to the Nutribullet 900 is similar to how I feel about the Vitamix 5300. The Nutribullet wins out for the average person on price-range and convenience for someone on the go. But if you want a blender that can do everything and is guaranteed to last a long time - get the 5200. Oh - and consider batch size. If you're blending for a large group of people, the small cups on the Nutribullet aren't going to cut it. The Pro 900 falls short on the warranty and tamper, but has a stronger motor. You'll also probably find it much more affordable. Now, I love Vitamix blenders. I've been a happy Vitamix owner for the past 5+ years. But when you look at the S-series, they don't offer enough for their price-point. The motors aren't very strong. They're even less powerful than the Nutribullet 900. A quick search online reveals users complaining about multiple issues including the weak motor and leaking seals. In my experience, the Nutribullet Pro has done everything I've wanted it to do besides hot liquids. So in this instance, I'd rather pick that up and save a few bucks. I don't hesitate to recommend the Nutribullet Pro 900 for a single person on a budget. But if it's within your price range, then I think it's well worth getting the Vitamix Explorian E310. Sure, it doesn't have all the convenient cups and lids that the Pro 900 has. However, the tamper, powerful motor and 5-year warranty make the E310 worth your money. Let's also not forget the fact that it can do hot soups. Trust me -- I'm someone that uses the Pro 900 regularly for simple blends and I love it. But if I had to choose between the E310, E320 and Pro 900, I'm going to pick the E310 every time. When it comes to smoothies, the Nutribullet Rx and Nutribullet Pro 900 are great. They’re both powerful enough to make thick smoothies on par with what a Vitamix can do. However, I wouldn’t recommend the Magic Bullet or Nutribullet 600. Whenever I try to use my parent’s Nutribullet 600, it always falls short on ice crushing or completely struggles and shuts off. My Pro 900,on the other hand, has enough power to make thick smoothies with ease. And they’re super easy to drink right out of the blender cup. The Nutribullet Rx is even more powerful than that. Now, any Vitamix is going to make smoothies without breaking a sweat. But for the sake of simplicity and affordability – I highly recommend looking into the Explorian E310. It’s what I’d call a “hybrid” between a personal blender and a regular Vitamix countertop one. It’s powerful enough for all the usual Vitamix tasks (even hot soup) but has a smaller container and as more efficient for making smoothies for 1-2 people. Let me be clear that neither the Vitamix or Nutribullets can juice without extra help. Juicing requires that all the https://www.nutrition.gov/subject/shopping-cooking-meal-planning/juicing-101” target=”_blank” rel=”noopener”>ingredients be completely liquefied and stripped of their fiber rather than pulverized into a smoothie. So with either blender, you’d need a cheesecloth or really thin mesh to remove the pulp from the juice. With those steps, both the Nutribullet and Vitamix can juice. For the sake of convenience and small footprint I’d recommend the Nutribullet Rx or Nutribullet 900. But if it’s in your budget, counter-top Vitamix models like the 5300 would be a better choice, simply because it’s bigger. Since these steps are time consuming having a bigger vessel is important. We even picked it over the https://thrivecuisine.com/kitchen-appliances/blenders/vitamix-6500-review/”>Vitamix> in our other review. The Magic Bullet can do some very thin smoothies, light ice crushing, some dry grinding and basic food chopping. But compared to a Vitamix, the Magic Bullet is in a completely different league. A Vitamix can pulverize almost any blend with ease and handle hot liquids. It has too weak a motor (only 250 watts). The Nutribullet 900 (which has 900 watts) is over 3 times as powerful. My recommendation is to only get a Magic Bullet for light blending jobs. In summary, if you’re looking for the convinience and price-range of the Bullet blender line – get the Nutribullet 900. 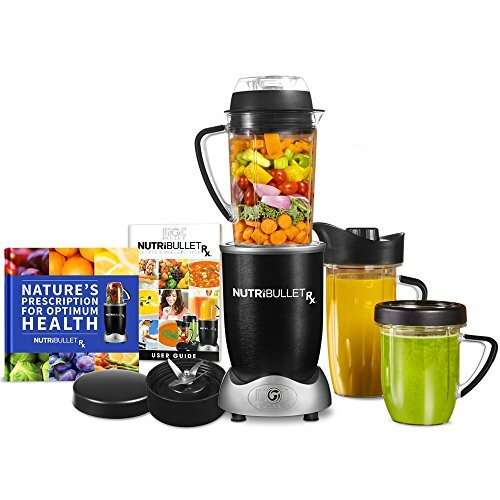 You can get the Nutribullet Rx, but give it’s usually price point I strongly believe that you splurge on the Vitamix E310 or even a refurbished 5300. Both a great bang for your buck and have long warranties.